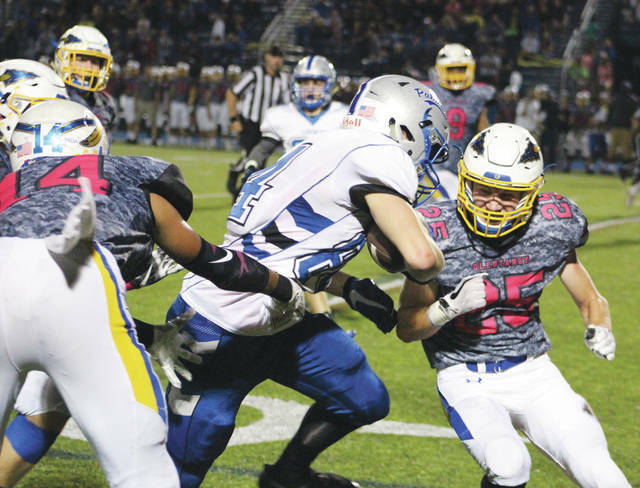 Olentangy’s Conor Sherry (25) tackles Liberty’s Jacob Sincek during a game earlier this season. The Olentangy and Whitmer football teams know a thing or two about playing second-round games in Tiffin. The two met in the second round of the 2015 playoffs, when both were Division II programs, at Frost-Kalnow Stadium — a game the Braves won 24-21 with a 52-yard field goal by Jacob Bell at the horn. “It was a classic a couple of years ago,” Olentangy coach Mark Solis said. “I expect another close battle. Our kids, now four years in a row, understand when you make it to the round of 16, everyone is good. While the showdown could end in a similar fashion, this is a different year. The teams, now both in Division I, are led by a different cast of characters and, well, even the venue is different. This time they’re playing at Tiffin Columbian. Kickoff is set for tonight at 7:30 p.m. The Braves (8-3) got there by rallying past Dublin Coffman 28-24 in the first round. Down 10-0 at halftime, Olentangy outscored the host Shamrocks 28-14 in the second half to seal the deal. Three the Braves’ four second-half touchdowns — two via strikes from Riley Bruening to Jace Middleton and another to Luke Riedel — came in the fourth quarter. Top-seeded and unbeaten Whitmer (11-0), meanwhile, slipped past eighth-seeded Lorain 31-28 thanks to a 20-yard field goal from Eric Filby as time expired. Three of the Panthers’ four touchdowns came via fumble recoveries — they fell on their own fumbles two different times in the end zone and returned one of the Titans’ to the house for the third. While Whitmer’s scores were of the unconventional variety last Friday night, Solis and his Braves know the Panthers have the talent to punch a few in the old-fashioned way. Whitmer quarterback Riley Keller, the cousin of Pittsburgh Steelers quarterback Ben Roethlisberger, will look to bounce back after struggling in the first round. The sophomore, who is already drawing interest from Division I programs such as Ohio State, completed just 10 of his 27 passes for 122 yards. Junior running back Kobe Myers, meanwhile, finished with 149 yards on 23 attempts in the win over the Titans. As for when the Braves have the ball, well, they’ll just do what they do.